Hello, I am Pickle and I am just two years old. 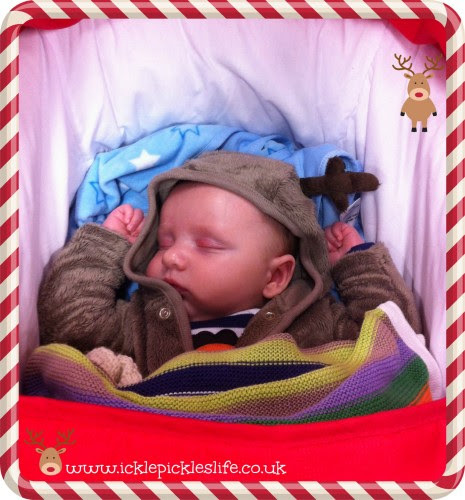 My blog is over at www.icklepickleslife.co.uk I am very excited to be writing this Guest Post! Thank you Mama Mummy Mum! This is my third Christmas, and I am very excited. I thought I would share with you some tips for a Stress Free Christmas. Us tots like our routine. Keep to our feeding and sleeping routine as any other day. Keep to other routines that we have, and look forward to - if you usually go for a walk, then try and do it over Christmas too. Spread our presents out throughout the day, or even over a couple of days. We get very overwhelmed, very quickly! Limit the chocolate and other 'treats'. they make us hyper! Don't worry if we don't eat much dinner that you have taken ages to get ready. We are just very excited, possibly over-tired and we don't even really know why! Don't put your very special, very expensive or treasured decorations or keepsakes within our reach, to us they are just another shiny, sparkly new thing to make us want to touch! Let everyone have their own space, including grandparents and teens. Keeping everyone in the same room the whole time may make some of them grumpy! I hope these tips help! Don't forget that although we are so very excited, and may talk about the upcoming visit from Father Christmas, we don't really understand what is happening, so don't expect too much from us. And expect a few tantrums and tears. Have some distractions ready, and a quiet corner for us to chill out too! Oh and be careful what you say to us about Santa calling. We get spooked very easily, and get a bit worried about change and new things, and things we do not understand. Thanks for the tips Pickle, routine is definitely key in our house!! Does anyone else have tips they'd like to share.